Here at Beauty Resource we love a brand with a conscience and this is why we completely covet the brand Amazon Beauty. Founders Fabian Lliguin and Anna Ayers have made it their mission to ensure the beauty of the planet is preserved so work hard to ensure they are promoting sustainable beauty products. In order to achieve this they send troops into the Amazon Rainforest to work with native tribes and nationalities to help protect intellectual property rights. All products are made from high quality natural ingredients which contain no nasty chemicals, parabens, sulfates, dyes or petroleum and are 100% vegan. One product that particularly caught our eye was the Rahua Finishing Treatment which is already a favourite among celebrity’s Johnny Depp, Jennifer Lopez and Gwyneth Paltrow (who loved it so much she even mentioned it on her website Goop.com). This is essentially a finishing treatment which is designed to repair and add shine. In terms of how to use, it is extremely versatile and can be used on wet or dry hair before blow-drying and straightening to prevent breakage and repair damage, or it can be run through wet wavy or curly hair and left to dry giving great shine and frizz control. This is also great for those who want to add a little texture to their hair and again can be used on ether wet hair before blow drying or on dry hair with a little applied to the root area before some teasing or mussing. The treatment will strengthen the hair but unlike many others will not leave it heavy, clumpy, oily or crunchy but weightless and glossy instead. Apparently the key ingredient to this treatment is super-fine Rahua oil molecules, which deeply penetrate the hairs cortex to rebuild even the most damaged barnets. This product is a real luxury and we can assure that a little goes a very long way and though the price point of £36.50 may seem a little steep remember that we don’t bat an eyelid when we shed out that much on a myriad of other beauty products so why should we treat our hair any differently? If you needed any more convincing then remember this is one of the most sustainable products around,is completely vegan and helps to preserve the Amazon rainforest, so sleep soundly…with gorgeous hair. 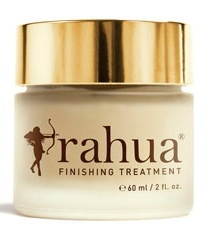 You can pick up Rahua Finishing Treatment from Liberty.